It is very important to carry out fire extinguisher maintenance regularly so that you meet the strict fire regulations. When your fire extinguishers need refilling, checking, and a general safety check for your fire hazards is required you can rely on the experts from ETC Fire to come to your aid. ETC Fire cover the whole of Hampshire and offer a high standard of service and reliability. On an ongoing basis we will help you maintain your safety records and fire equipment to standard, at competitive prices. ETC Fire can offer a complete range of fire safety services. From contract servicing of your fire extinguishers with a comprehensive servicing and reporting strategy which logs every fire extinguisher's history so there is any doubt. Individual assessments for all sizes and types of premises includes a fire safety check and advice on installation of the appropriate fire prevention apparatus. All kinds of fire extinguishers can be safety inspected, maintained and supplied by ETC Fire. We have a wealth of expertise and experience in the fire extinguisher market and cover all of Hampshire. Our fire extinguisher maintenance operatives will schedule your yearly checks so that you don't have to remember to call us. Small or large businesses require fire extinguisher maintenance Hampshire areas and we can travel to all areas of Hampshire to ensure that your fire safety equipment is up to scratch. If you know what equipment you need, contact us HERE. If you need your O2 extinguishers refilled, Co2 cartridge and Vacufill charging are undertaken when the appropriate time has come. 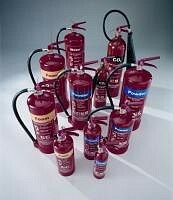 If you require a fire extinguisher maintenance Hampshire service please call ETC Fire. A fire can damage your life and property. Don't leave your safety to chance. Copyright© 2019 ETCFire. All Rights Reserved.